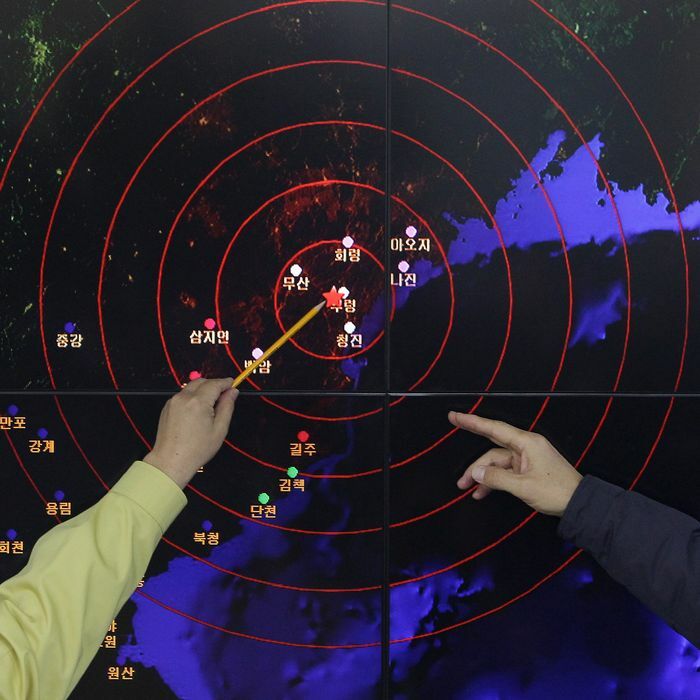 South Korean officials point to the nuclear test site where North Korea conducted a hydrogen bomb test in early 2015. North Korea is continuing to make grand gestures ahead of its upcoming summit with the U.S. and South Korea, announcing on Saturday that it will dismantle its only known nuclear test site, complete with an accompanying ceremony, between May 23 and 25 (depending on the weather). According to North Korean state media, the regime’s Foreign Ministry has announced that it will demolish the site’s underground tunnels using explosives, as well as dismantle the buildings at the facility, which is located near the northeastern village of Punggye-ri. North Korean leader Kim Jong-un announced that the test site would be shut down at his meeting with South Korean president Moon Jae-in last month. The regime has also announced that it will suspend its testing of nuclear devices and intercontinental ballistic missiles — though Kim has explained that they are only doing so because they have already successfully developed the weapons. Kim has already invited foreign journalists to watch the dismantling of the nuclear test site, an offer the Foreign Ministry reiterated and explained the process for on Saturday. The demolition viewing party is now scheduled less than three weeks before the June 12 summit in Singapore between Kim, Moon, and President Trump. It should be noted, however, that it is not yet clear if North Korea will also allow disarmament experts to come monitor the work. In 2008, North Korea invited journalists to watch it destroy a cooling tower at a reactor site after signing an earlier nuclear deal with the U.S. in exchange for about $400 million in aid. Three months later, it accused the U.S. of failing to live up to the terms of the agreement and resumed processing plutonium. All announcements from North Korea regarding its nuclear program should be viewed skeptically, and even more so regarding denuclearization, which has never meant the same thing to North Korea that it has to the U.S. and its allies. President Trump, at least in some of his public statements, hasn’t made it clear that he understands what North Korea has been offering thus far, either. There also seems to be little incentive for Kim to give up his country’s nuclear weapons, particularly after President Trump deliberately violated the 2015 Iran nuclear deal this week, in what he paradoxically framed as an example of America’s trustworthiness. There might also be a new war in the Middle East as a result of Trump’s decision by the time he meets with Kim and Moon. For its part, however, Pyongyang appears to be playing all the right symbolic notes ahead of the historic summit. Earlier this week, North Korea released three Americans who were imprisoned in the country to Secretary of State Mike Pompeo, apparently fulfilling a U.S. precondition for the upcoming summit. President Trump met the three men upon their arrival in the U.S., and has already begun appreciating the congrats about his possible Nobel Peace Prize for bringing “victory for the world” at the summit.